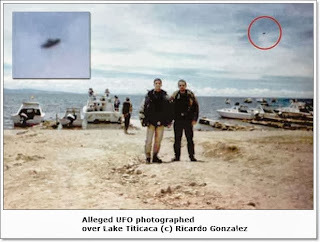 Inexplicata-The Journal of Hispanic Ufology: Bolivia: 100 UFO Fly-Overs in Two Years? Pablo Santa Cruz claims the greatest number of sightings took place in Quillacollo and Tiquipaya (Cochabamba) and especially in the Altiplano o areas with remnants of ancient civilizations. The studies of a Bolivian ufologist who is most involved in the subject – Pablo Santa Cruz – account for nearly 100 unknown objects reported in Bolivian skies in the past two years. Santa Cruz heads “Proyecto Ovni”, a four-hour long documentary that discusses the phenomenon, as well as two books on the subject. Throughout the research process, the UFO expert acquired knowledge that he now shares in an interview with OPINION. A: Unidentified flying objects (UFOs) are entities or devices that can be of human and non-human provenance, that is to say, aliens. In the first case (human origin), the most numerous UFO sightings would be cigar or disc-shaped craft, created by an elite in Nazi Germany that contacted beings from another world from which they secured this prodigious technology. They could also be prototypes from the western powers (US & UK), built conventional yet advanced technology. As far as the UFOs of alien origin are concerned, we have the tentacled ones and the ones shaped like tops or balls, hailing from “Chang Shamballa”, an enormous extraterrestrial base built by aliens who reached our universe in remote times and have governed us since then. Q: According to your studies, how many UFO sightings occurred in the country? A: While there is no official record, we know that there are thousands of UFO sightings in Bolivia. During the transmission of “Proyecto Ovni” in Bolivia, that is to say, since 2012, we have recorded at least one hundred confirmed sightings. Twenty of these have some sort of documented support. Furthermore, we find the cases involving UFO crashes in Tarija and Cochabamba in the 1970s. There is also the sighting recorded on the highway north of Santa Cruz in the 1980s, which had hundreds of thousands of witnesses. Q: Which places in the country do sightings occur most frequently? A: The Andean region, without question. Lake Titicaca and Mount Illimani, the Bolivian Altiplano and certain regions of Amazonia. We should also highlight that regions with megalithic and archaeological remains of ancestral cultures are UFO hotspots, not only in Bolivia but worldwide. Q: In the specific case of Cochabamba, where do these UFOs manifest most frequently? A: Most recently in the areas of Tiquipaya and Quillacollo. These have been properly documented UFO sighting areas with an abundance of witnesses. Q: How do you make sure that a sighting is indeed a UFO and not a weather phenomenon? A: Sightings involving vehicles are too notorious to be mistaken for meteorological phenomena. For example, sightings of weather balloons and satellites are unmistakable, since their movement is far too slow and conventional. Sightings of real UFOs are extraordinary due to their swiftness and irregular flight, which cannot be emulated by any man-made device. Q: What is the purpose of UFO visits to Earth? A: This is a troublesome subject, since the UFO phenomenon is the subject of tenacious concealment by the government, precisely because the truth on the alien purpose in this world is being covered up. In “Proyecto Ovni” we state, with the support of hundreds of documents, that aliens have been present since the very origins of mankind, directing the progress of this world over time, as this is a gigantic genoarchetypal (sic) experiment with dark intentions. Disclaimer: The views expressed here are solely those of the author and do not in any way represent the views of INEXPLICATA or The Institute of Hispanic Ufology.